In modern Western culture, different colors represent different things. Ever notice how you feel more awake in the yellow-painted kitchen than you do in the deep forest green of the bedroom? Or how purple velvet signifies royalty; in reality, only royalty could afford purple dye before artificial dyes were invented? Or how we almost always call red a color of power, as in power suits or power ties? Some of these have changed over the course of history; we see pink for girls and blue for boys these days, but two hundred years ago, the colors were reversed, because blue was depicted as calm (especially in a Christian religious sense, as blue is the signature color of the Virgin Mary) and pink was a variation of red for power. 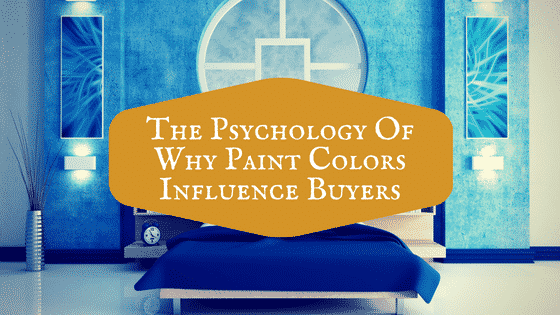 But now, in the 21st century, choosing certain paint colors can influence buyers of all sorts of things, from clothing to cars to home decor. If you want to sell men’s clothing, blues and greens are good choices because both men and women shop in such places; everyone feels comfortable with blue, and most with green. For a restaurant, the paint colors would depend almost entirely on the target buyer. A tea room could be in pastel paint colors and frills, a family eatery in earth tones and durable muted yellows and golds for appetite, and a fast food joint in yellow for appetite and white for cleanliness. Using different colors for different target buyers is important. Depending on your venue or your event, you will want to use different colors. For example, my house is a soft blue-gray color with white trim, and looks calming and inviting on the outside because of it. On the inside we have all the colors of the rainbow; yellow in the kitchen for energy and appetite, cream in the main rooms, blue in the master bedroom, and that cream again in the kids’ rooms, with an accent wall in each. My girly scientist has a pink wall with decals of the planets, and my perky Goth has a deep purple wall with green accents. Appealing to both buyers and the people for whom they are buying – such as me and my children – can be a challenge. This is when neutrals paired with a splash of color – like my kids’ accent walls – is a good choice. In restaurants or in stores with kids in mind, bright colors can be excellent… but sometimes the adults who actually have the money can be overwhelmed or even irritated by too many colors in a single place. This is a cue to go with neutrals – warm browns and creams – with a few pops of brighter paints.